One of my favorite things to do is get together and cook with my girlfriends! There is just something about women getting together, in the kitchen, eating, laughing, and having a good time that nothing else can match. I am also very lucky to have some great foodie friends as well. Take my friend Melissa for example. She has an AMAZING palette and has taught me so much about how wine and food work together. We have had many evenings where that alone was the sole topic of conversation for hours. We have traveled over several state lines in search of great cuisine, and have many, many stories we could share! She is a gypsy soul and I love her dearly! So when she says "I have the recipe I want to try, are you game? ", there is no hesitation! I can't wait to share this recipe with you so Let's Get Started! First of all, you will need to add your cumin and grated ginger to your sausage. Next, brown the sausage, about 10 minutes. Bring to a boil and then drop to a simmer for about 10 minutes. Green onions and kale. Put your lid on and let that simmer for about 5 minutes. Just long enough for that beautiful kale to wilt. Oh gosh doesn't that just look....divine? Now add your rice noodles. I realize that this can be a pricey thing to pick up and even inaccessible in some areas, but fettuccini noodles will work here too. Let them cook for about 10 minutes. I wish that there were words to describe what this smells like! Melissa and I are both practically drooling at this point! 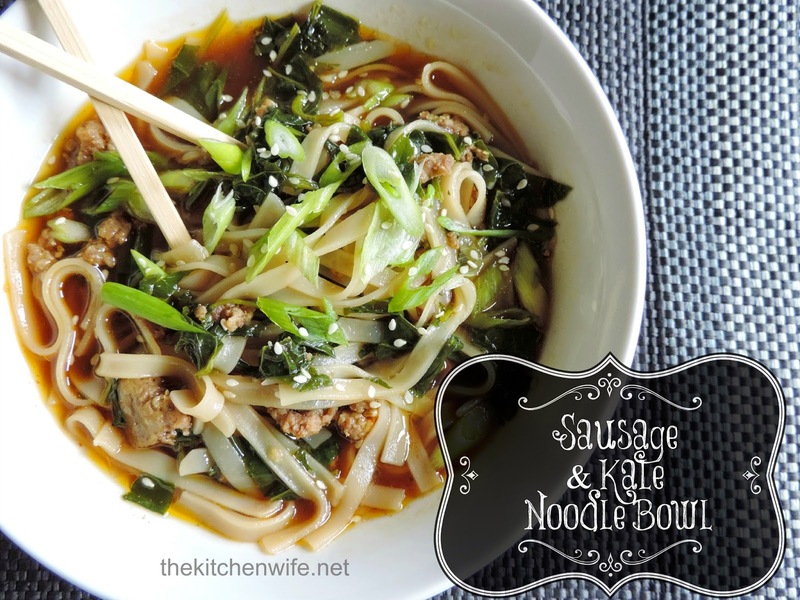 Just look at that sausage and kale and noodles. Oh, and the broth...it is like a little bit of Heaven in a bowl. One thing is for certain, when you get in the kitchen with friends ONLY good things can happen. Even if your recipes don't turn out (but I assure you, this one did), the memories you will make and continue to share will nourish your soul as much as a good meal! I hope you enjoy this recipe and I would love to hear your story about making it! In a mixing bowl, add your sausage, grated ginger, and cumin. Add 2-3 tbsp. of olive oil to a Dutch oven over high heat. When Dutch oven is hot, add sausage mixture. When sausage is brown add the chicken stock. Bring to a boil, and drop to a simmer. Simmer for approximately to minutes. After 10 minutes, add your fish sauce and soy sauce. Next, add the green onions and chopped kale. Cover the pot and simmer for 5 minutes. After the kale has wilted, add the rice noodles. Cook for 10 minutes, until al dente. I just made this last night for dinner and it was really good. Really tasty and comforting. A great way to use my frozen kale from the summer garden too. Thanks!